U.S. Surgeon General Says Working Together Is Key To Combating Opioid Crisis : Shots - Health News The country's top public health advocate says the cycle of opioid addiction won't be stopped without more money from Congress and cooperation among federal, state and local officials. U.S. Surgeon General Jerome Adams, shown here testifying before a Senate committee in 2017, says President Trump's top health priority is addressing opioid addiction. About a month ago, President Trump declared the opioid epidemic a public health emergency. He's spent a lot of time talking about the severity of the drug crisis. But he's spent less time outlining the specific steps he'll take to fight it. Today, a White House analysis declared that the true cost of the opioid epidemic in 2015 was more than half a trillion dollars. 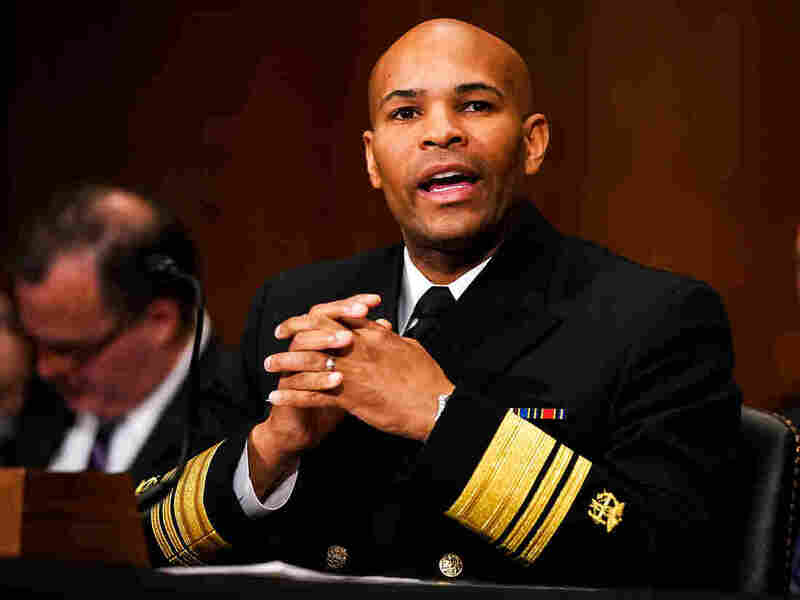 As Trump formulates his plan, All Things Considered's Elise Hu spoke with Dr. Jerome Adams, the president's surgeon general, about what's next. Excerpts of the interview follow, edited for length and clarity. What actions should we expect to see from the president and when? One of the things that I should mention that folks may not realize, that administration has already spent more than $800 million on prevention treatment and for naloxone for first responders. I think getting that funding out to communities is one very important thing the administration is working on ... As Surgeon General of the United States, the nation's top public health advocate, I'm focused on prevention and helping folks understand how we can prevent the start of addiction in our citizens. Patrick Kennedy, the former Congressman who served on the White House Opioid Commission, suggested that it would take at least $10 billion to fight this epidemic. Do you expect the president to ask for that money from Congress? Well, the president has already asked for a significant amount of money in his pleas to Congress. Ultimately it's going to be up to them to decide how much they give us and how. But what we know is Congress isn't going to give us enough money to tackle this epidemic alone. It's going to take federal, state, and local efforts. It's why I'm trying to partner with the business community, with the law enforcement community, and bring all partners to the table. This is a national problem that has taken decades to come to pass. It's going to take all of us on deck if we're going to tackle it. Do you think this epidemic can be brought under control without additional money from Congress? To answer your questions directly, no. But I'm also confident that with Congress and the president working together, we will get additional funding. My part is making sure ... we're bringing other resources to bear, to help tackle this epidemic. You mentioned that you support more funding in general, but can you give us an example of a bill that the president has supported that did have some sort of appropriation tied to it? Well, the Affordable Care Act repeal that the president put forward had funding attached to it for attacking the opioid epidemic. But then that would have gutted Medicaid? That's some folks' contention. Again, that's going to be up to Congress to sort out. I know that one of the ways that folks have talked about reforming health care is through Medicaid block grants. And there are different folks with different opinions about what would happen in different scenarios. At the end of the day, what I'm focused on is making sure we maintain funding to respond to the opioid epidemic, and I believe the president has expressed that he's behind that, also. I want to ask you a little bit more about what's shaped your personal view on opioids. You were a practicing anesthesiologist during the early years of the epidemic. You've talked about being in the position of writing prescriptions for fentanyl and morphine. How did that on the ground experience shape your understanding of this crisis? Personally, I've dealt with it. I've visited my brother in state prison just recently. He's still trying to get treatment for his addiction so I want folks to understand, I share that story, because I want folks to understand that addiction is a chronic disease and that if we don't treat it as such, we will be doomed to continue in this vicious cycle. A lot of people whose families have been touched the way that yours has are waiting for the president to take more substantive action. Many of them are saying they've heard promising statements, like the public health emergency declaration, but that they lack substance. So what would you tell them? I would tell them that number one, the president formed his commission on opioids back in March. They put out nine different recommendations in the initial report, and the Department of Health and Human Services has addressed all nine of those recommendations. They've put out another 50 plus recommendations in the final report. And we've already been working on most of those. While folks are frustrated, and I understand that they're frustrated because we've got over 150 people dying every day from overdoses, we've had our foot on the gas from day one that I've been in this position, and even before, the president came out and said, this is his top health priority. We will get there, I'm confident we will, but we will only get there working together. Ana Lucia Murillo and Elise Hu contributed to this report.